I noticed today that Savills are offering for rent an apartment in Charters, one of the great country houses of the 1930s. Charters was built for Frank Parkinson (1887-1946), Chairman of engineering firm Crompton Parkinson & Co. Ltd., which made everything from hydro-electric plants to locomotive engines. As you might imagine with an industrialist who had made a fortune out of new technology, Parkinson was a forward-looking, progressive type of man. He liked modern design. As a result, Charters could never quite make up its mind what it was meant to be. The Parkinsons’ architects were George Adie and Frederick C. Button, whose buildings, including Athanaeum Court in Piccadilly (1936) and the Electroflo Factory in Acton (1937), tended towards an austere, rather stark Modernism with little or nothing in the way of ornament or decoration. And Charters, which was finished in 1938, appeared to be frankly austere and uncompromisingly Modern. It was a gleaming white box, its flat roof crowned with a massive wireless aerial. But as you approach the house, it becomes obvious that Charters is not all it should be. If it was serious about proclaiming the Brave New World of the future, its walls should be of reinforced concrete, or at least covered with a decent cement render. But Charters turns out to be faced with slabs of Portland stone – fine for St Paul’s Cathedral or the British Museum, but not quite the thing for the futuristic palace of an electric entrepreneur in the 1930s. Inside, you might expect to find textiles by Marion Dorn, perhaps, and furniture by Serge Chermayeff. At least a little glass and chrome, at least some white walls and abstract paintings. But you’d search in vain. Doris Parkinson’s ideas on interior decoration, and those of her ensemblier Mrs G. R. Mount, were more conventional. 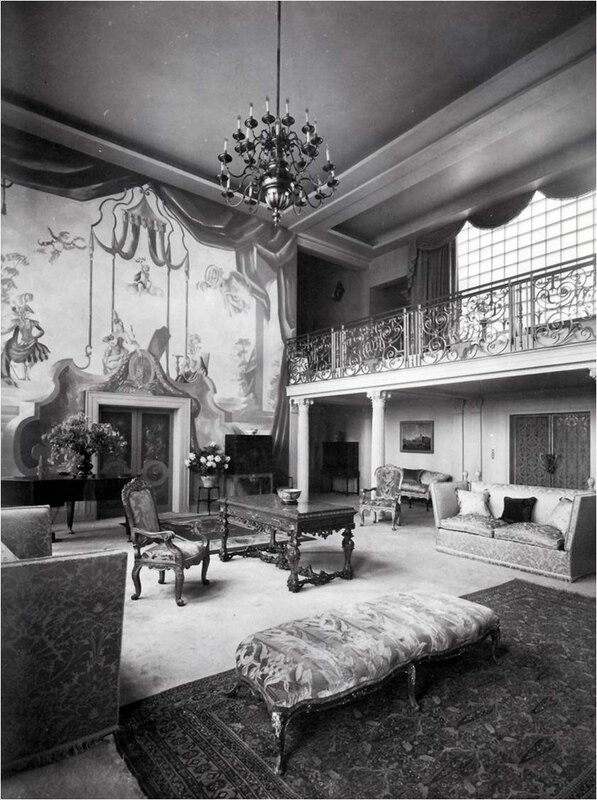 The drawing room was panelled in pine, with geranium-red brocade curtains; the dining room was furnished with eighteenth-century chinoiserie chairs in mahogany and hand-painted Chinese paper on the walls; the decoration of Mrs Parkinson’s bedroom owed more to Louis XVI than Lubetkin or Le Corbusier. The technology was there, but it was hidden. The curtains in the living hall were opened and closed by electric motors; the gas-heating boilers for the central heating and the thermostatically-controlled water heating were tucked away in the basement, along with the air-conditioning plant and the motors which drove the centralised vacuum-cleaning system. The chrome was to be found in the kitchens, where there was a combined electric dishwasher and waste disposal unit, probably the only one in an English private house at that time. Only here and there above stairs did contemporary design intrude on Doris’s tasteful decorative scheme. The four-bedroom apartment being offered by Savills includes the original library, Doris’s boudoir and her fabulous pink onyx master bathroom. A snip at £5,769 per week.